Puppy preschool is in session. Best Friends Animal Society’s newest facilities are the hottest thing in puppydom since chew toys: a complex designed to provide puppies with everything they need to become healthy, well-balanced members of their adoptive families. Val’s Puppy Care Center will help save lives and bring us closer to a day when there are No More Homeless Pets®. Best Friends Animal Society’s newest facilities are the hottest thing in puppydom since chew toys: a complex designed to provide puppies with everything they need to become healthy, well-balanced members of their adoptive families. The recently dedicated Val’s Puppy Care Center at Best Friends Animal Sanctuary near Kanab, Utah, can accommodate up to 240 puppies and mother dogs on an annual basis. Made possible through many generous donors, including eBay Foundation, Valerie Diker, Laurie and Carlee Mc Grath, and the Enrietto and Kallas Foundation, the center will be a safe haven for orphaned puppies rescued from puppy mills, hoarders, abusive situations, or abandonment, as well as expectant mother dogs rescued from these situations. Best Friends’ Chief Executive Officer Gregory Castle said, "Val’s Puppy Care Center will help save lives and bring us closer to a day when there are No More Homeless Pets®." The first stop for new pups at the sanctuary will be The Enrietto and Kallas Foundation Puppy Admissions building, a safe place for new pups and moms to receive their vaccines before seeing the great wide world. The second building, The Laurie and Carlee Mc Grath Puppy Preschool, is where the puppies move when they’re ready to meet new people and truly learn the ropes of life. This two-building setup has several state-of-the-art features, including radiant heat in the flooring, passive solar design, thermal heat exchange, and epoxy floors. Besides the undeniable cuteness of puppies, there is a very serious purpose behind the facility. The center ties into Best Friends’ anti-puppy-mill campaign, Puppies Aren’t Products®, which is committed to ending the practice of inhumane commercial breeding. As Best Friends’ work in this area has increased, there was an urgent need for a facility that provides the kind of medical, social and emotional care required by puppies rescued from this environment, before they can find permanent, loving homes. The new facility also ties into First Home Forever Home, Best Friends’ campaign to help people keep their pets for life. “Puppies are people magnets. Their limitless affection, natural curiosity, playfulness, and puppy breath appeal to our most basic nurturing instinct. But unsocialized puppies run a high risk of losing their home in the first year of their life,” said Patty Hegwood, Best Friends’ director of animal care. “Puppy socialization classes have been a great success at Best Friends and a popular volunteer activity. 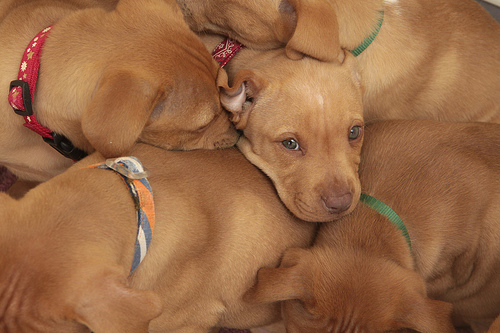 Before we held these classes, many adopted puppies were returned to us. Because of the class training, that number is now virtually zero. Now, with the new facility, the number of puppies who graduate from Best Friends’ puppy classes will significantly increase,” Hegwood said. Hegwood said the puppy center will feed into Best Friends’ outreach as well: “Our volunteers come and learn good foundational care and training. It is really a great opportunity for them to go back into their communities and local shelters and teach these valuable skills. “And even though Best Friends makes a life commitment to every animal in our care, our hope is that we send these little guys out with a solid foundation, so they have a home for life with their families,” she said. Best Friends Animal Society is a nonprofit, membership organization building no-kill programs and partnerships that will bring about a day when there are No More Homeless Pets®. The society's leading initiatives in animal care and community programs are coordinated from its Kanab, Utah, headquarters, the country's largest no-kill sanctuary. This work is made possible by the personal and financial support of a grassroots network of members and community partners across the nation. Logo "VIP" treatment for the puppies at Best Friends Animal Society' Puppy preschool is in session at Val's Puppy Care Center at Best Friends Animal Society Best Friends Animal Society CEO Gregory Castle introduces puppies to their new digs Each litter is named after a theme. "Adventure Puppies" at Best Friends new puppy care center. 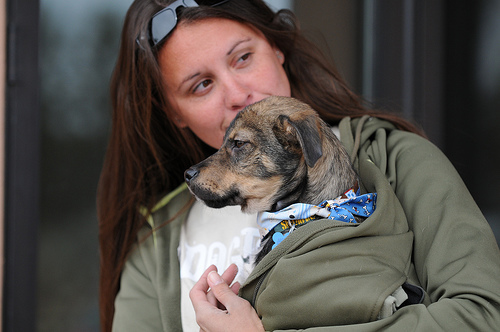 Mckenzie Garcia, Dogtown caregiver, snuggles with pup.